As a former portrait photographer, studio lighting and how to position strobes and modifiers effectively was always challenging. The goal is not to make the light glaringly artificial. I relied heavily on David Hobby’s excellent blog and website Strobist. The simple premise of Strobist is Learn How to Light. There is a Lighting 101 primer for anyone having questions on how to use strobes, off camera flash, and different lighting set-ups. The blog is a plethora of lighting information from many contributions of professional photographers. Zeke Kamm is a photographer and the Editor of Nice Photography Magazine and Trade Secret Cards. 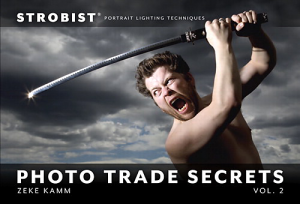 He has selected 25 images from contributors of Strobist.com that are tear-out mini lessons on the art of portrait lighting. This is a novel idea and one that will come in very handy for photographers using artificial lighting for their shoots. The book is a bit larger than postcard size, so the idea is you can tear the card you need for a specific lighting situation. Personally, I would find it difficult to tear out any of the cards as they are all quite intriguing.The image is on the front and a detailed lighting diagram and explanation is on the rear of the card. Many of the lighting set-ups use fairly simple modifiers and equipment: one or two flashes or strobes, a few gels, reflectors, softbox, or shoot-through umbrellas. A few of the images have more complex and expensive gadgets for manipulating light like a smoke machine or octobox. For photographers who want to learn how to engineer and modify their lighting to create professional and imaginative images, the technical diagrams and explanations will be helpful. Lighting can be a very expensive venture (ask me how I know), and none of of images were created with only natural light. Photography is about capturing light, whether artificial or natural. Learning how to control it to create your vision of the final image is what matters. This book will appeal to portrait photographers who desire to bring their photographs to a high creative level.